If you want castles and mountains and rivers and roads in abundance, this is the trip for you. Stelvio Pass was once voted the world's best riding road, and it can be found just a half hour ride from the hotel we use as our base. 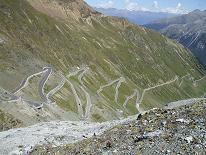 Not just Stelvio though, because we are surrounded by over 100 mountain passes. And not only mountains as we are only 50 miles from Neuswanstein - the castle from Chitty Chitty Bang Bang. Not forgetting the castles alongside the Rhine. How many do you want? Then there is Lindau, the home of the cuckoo clock. 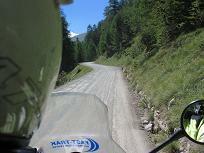 But of course the best part of our trip is the amazing roads. Roads which are clear of traffic for mile after mile but you have to be especially careful because the views take your breath away and it is no exageration to say it is difficult to concentrate on the riding when you are staring at a mountain wall or looking 4000 feet down into a ravine. This tour is a stunning, beautiful tour. No day is the same and each location somehow seems better than the last one. And just when you think its all over, on the way home we stop off at the Nurburgring. If this trip doesn't excite you, you have chosen the wrong hobby. The only thing we can think of more exciting than this trip is to jump out of an aircraft without a parachute, and, as we don't offer that as an option, this may be the way to get the adrenalin rush we often need.